Create perfectly sized, pressed, and portioned burgers any time with your own ground meats! Making your burgers yourself also allows you to season them exactly to your taste! Perfectly formed burgers eliminate 'fat' burgers that are undercooked in the center, and 'thin' burgers that fall apart when you try and flip them. 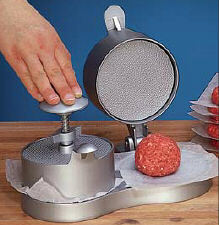 Make more burgers in less time with the 2 individual presses. Simply place ground meat on restaurant-grade paper on the two patty-forming trays. Place another sheet on top of each, close the lids and press the two large, comfortable patty-presser buttons down to compact the meat. Adjustable patty thickness of up to 1-1/2" thick. Measures 10.3 X 6 X 8.5 "